Isocracy Profiles: Martin Luther King, Jnr. The same motivation appears here as did the previous "Isocracy Profile" profile article on Albert Einstein; an attempt to identify inspirational individuals who have contributed to the nascent social and political theory that is isocracy. As with the previous article the same words of caution can be expressed; it is unlikely that anyone would agree with everything that constitutes the Isocratic outlook as expressed on these pages, and likewise identification of a deceased person with a named political theory can only be done on the basis of evidence from their works, rather than their explicit statement of identity - especially when that political theory only sees development after their passing. Martin Luther King Jnr was initially ordained as a Baptist minister in 1948, the same year he would complete his first degree, in sociology. After that, he would enter the Crozer Theological Seminary and graduate with a divinity degree in 1951, and then a doctorate in systematic theology from Boston University in 1955. Shortly after being awarded his doctorate he was elected to the executive committee of the Montgomery NAACP, following Rosa Parks's arrest against segregation, initiates a campaign against various "Jim Crow" laws over the next several years with the establishment of the Southern Christian Leadership Conference (SCLC), where he became its inaugural leader. The Southern Christian Leadership Conference (SCLC), an organisation that continues to this day, was practical and hands-on. It organised the Citizenship Schools programme of volunteer teachers, focused on teaching adult literacy, so they could pass voter-registration tests, driver's license exams etc. Heavily influenced by the works of Mahatma Gandhi, and especially the political principles of satyagraha (insistence and reliance on the truth) and ahimsa (nonviolence). After King's first Stride Toward Freedom published in 1958, he would spend a month in India as the guests of Prime Minister Jawaharlal Nehru to study Mahatma Gandhi's political strategy and principles of civil disobedience and non-violent direct action. King's actions have to be considered in a like context to that of Gandhi's - civil disobedience and non-violent direct action is not meant as an absolute principle, but rather a strategic preference which is effective in States which are liberal democracies at least in principle. he argued that if faced by a genocidal totalitarianism he would have "temporarily given up my pacifism and taken up arms" . Where there is social exclusivity or a grave injustice in such States such as strategic orientation can be effective, following the principles of revolutionary reformism. Civil disobedience implies engaging in deliberate law-breaking - as Rosa Parks had done. The non-violent approach proposes a certain moral standard, which challenges authority against its own claims of legitimacy, fairness, and inclusion. The direct action component challenges the activist to take up the issue directly and publically at the instance of the injustice. On this point, he identified that "The success of communism in the world today is due to the failure of democracy to live up to the noble ideals and principles inherent in its system" . In addition to principled strategy, King also advocated universalism. When King was arrested during the Birmingham campaign in 1963 to end merchant desegregation, a group of Alabama clergymen critcised "outside agitators" and called for use of legal channels to deal with matters of racial desegregation. King's response, "Letter from a Birmingham Jail" , argued: "In any nonviolent campaign there are four basic steps: collection of the facts to determine whether injustices exist; negotiation; self purification; and direct action. .. Injustice anywhere is a threat to justice everywhere .. We know through painful experience that freedom is never voluntarily given by the oppressor; it must be demanded by the oppressed." 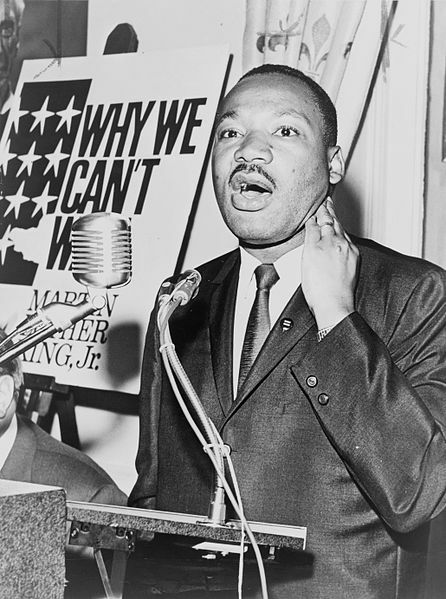 Over several years, the civil rights campaign in the United States, headed by King, but supported by millions, began to show results. In 1957 the U.S. Congress passed the first civil rights act since Reconstruction. In 1961 the Supreme Court banned segregation on interstate transport, In 1963 new civil rights legislation is announced and enacted in 1964. As a result of his efforts and leadership, at 35 King became the youngest person to be awarded the Nobel Peace Prize that year, and the following year the Voting Rights Act is enacted. But as the civil rights campaign gained momentum and victory by appealing to liberal principles, King also turned towards the economic conditions that had resulted from scores of decades from slavery to systemic and structural discrimination. In 1963 he led The March on Washington for Jobs and Freedom, which attracted 250,000, with the demands of ending racial segregation in schools, discrimination in employment, and a $2 minimum wage (equivalent to $16 in 2017). In 1966 he moved into a Chicago tenement noting the living conditions of the poor and advocating form an Open Housing Act, and in 1967 he began to campaign against the Vietnam War drawing attention to the opportunity cost of spending money on war when there was such much impoverishment, arguing that the war was a colonialist endeavour designed to enrich "individual capitalists of the West" . He argued that the United States should support what he called the "the shirtless and barefoot people" of the developing world, and condemned the US's "alliance with the landed gentry of Latin America", which provided the very conditions for a political ideology which it claimed to oppose: "We must with positive action seek to remove those conditions of poverty, insecurity, and injustice, which are the fertile soil in which the seed of communism grows and develops." Whilst fifty years have passed since MLK's death, his activism and example still stands as an inspiration as does the organisational infrastructure that he left behind. It is made even more impressive by the achievements in such a short space of time, and the principled positions that were taken. The fact that there was a raising of issues from political rights to economic rights must not go unnoticed. Apart from the inspiration, bravery, and strategy that he offers, there is also the imperative of fulfilling his dream of political equality enshrined and protected by law as civil rights, and economic freedom, established through a universal basic income that provides the necessary welfare, security, and health for all to be members of an advanced international society. 2] Martin Luther King Jnr, "Montgomery Bus Boycott speech", Holt Street Baptist Church, 5 December 1955. Commenting on this Story will be automatically closed on November 29, 2018.